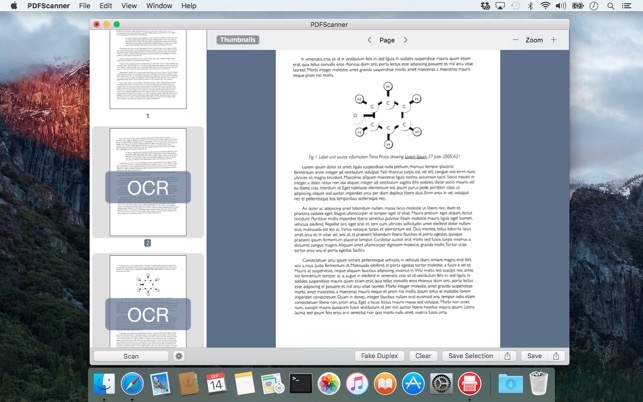 When performing OCR, PDFScanner adds the recognized text directly to the scanned image as an invisible layer, so the text can be selected and copied just like in other PDF files. • Optical character recognition to make the document searchable, allow to find it via Spotlight and other search tools or copy the text. 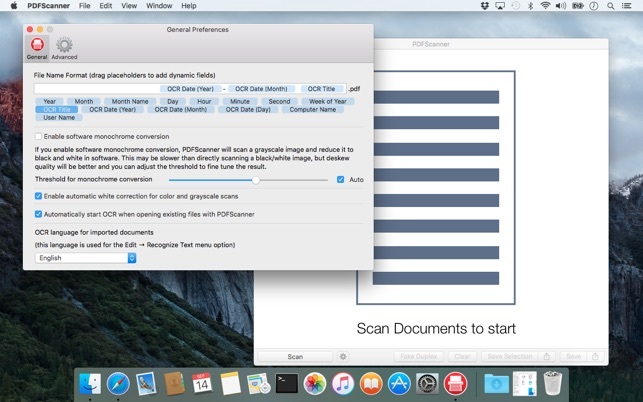 • Customizable file name patterns (include for example date, time and machine name in the filename) - PDFScanner can even guess the document title and date from the OCR text. 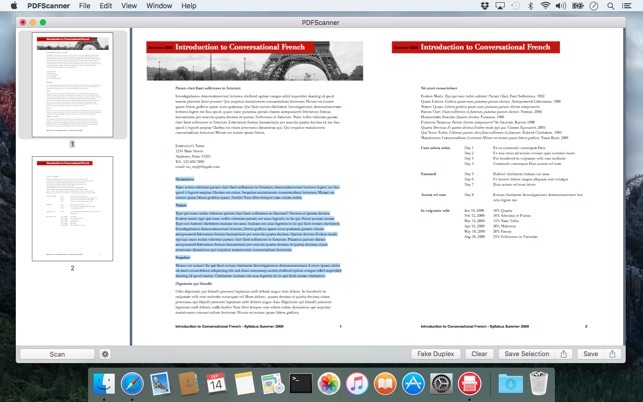 • It is also possible to open or import existing PDF documents and perform OCR on them via a menu option (the language can be set in the Preferences). 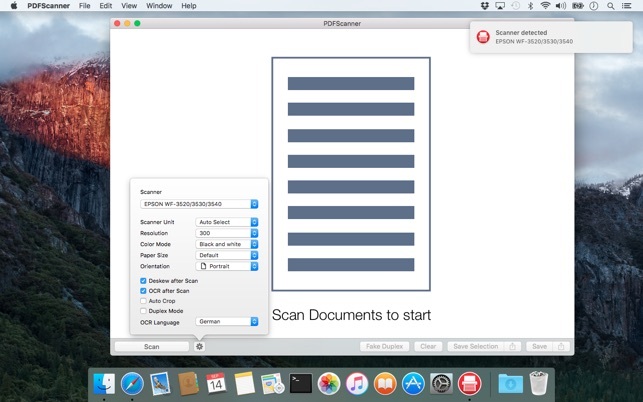 PDFScanner runs on all macOS versions from El Capitan to Mojave and is only available on the Mac App Store. I love this app. If you want to keep organized records that you can search or go totally paperless then this is a great app. Use it with my All In One printer/fax/scanner unit and this app goes where the native printer offerings don’t. Fast OCR and smart adjustments either automatic or custom have allowed me to power through several banker’s boxes of records of all kinds to create readable and searchable scans even from items with low contrast grayscale information. This app would have no problem making short work of a huge amount of business records. Auto deskew works great so no problem if the sheet feeder is a little sloppy. File saving and naming options including option to include scan date (year, week, month, second), or custom naming make quick work for organizing scanned files as they are processed. 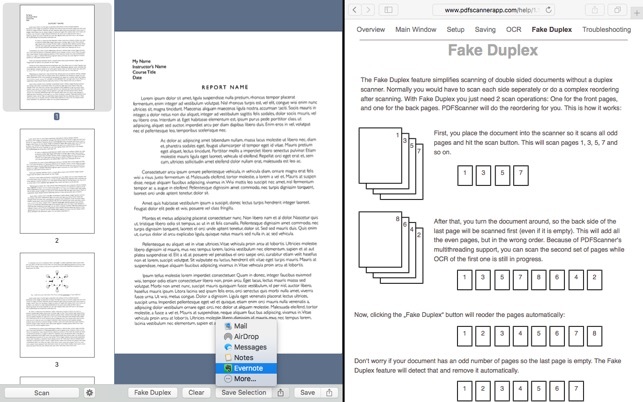 Also quckly processed MS Word docs to searchable PDF’s (Print to PDF, then open with PDF Scanner to automatically OCR). So happy with this app and the support from developer. Two thumbs waaaay up! Purchased the Epson 4550 PRINT/COPY/SCAN/FAX a while back, but after several hours trying to hook it up to the wifi, I gave up and went with a USB. It’s super frustrating when you spend over $600 on a fancy all-in-one and it’s rustrating when it does not work. 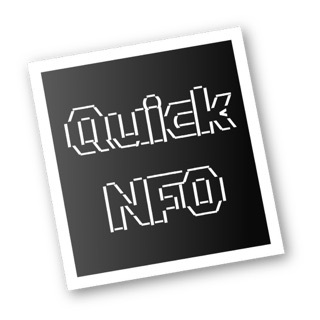 You need to install this program if you want to scan in text documents into PDF format. The Epson software does not work for scanning-Epson’s software does not recognize the USB connection. This program is a great work-around. Somehow it finds the USB connection. This program does a great job, and allows you to scan in "Black and White" which makes reasonable size files for documents with text. Great for people in business, medical fields, or students. This is what you will use the most. 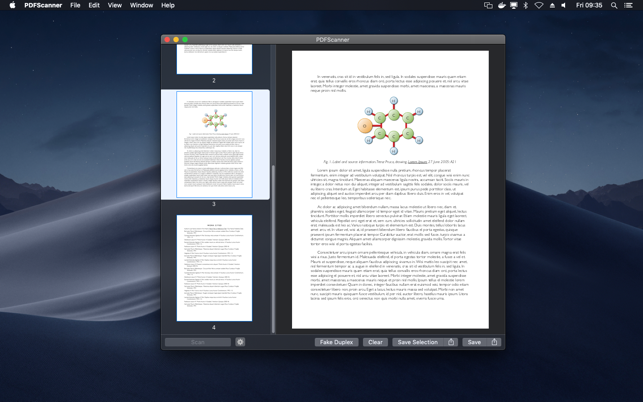 You can also use this program to open PDF files and add pages in PDF format to those files, or delete pages from those files. You can also scan in color if you want to put in a photo, and then convert the photo from PDF to JPEG in something like Photoshop elements. The only problem is that the diolog box comes up when you save is cut off, so you don’t see all the text, and if your are scanning in color, you cannot adjust the scan quality. And sometimes you have to unplug and the Epson All-in-one printer to reboot because it cannot find the scanner. Hopefully they will fix this with the next upgrade. Simple but powerful. All you'll need. I've used this app for several years now, but have never written a review. It always does exactly what I want to do. On the couple of occasions I've sought support (just questions, no problems) responses have come promptly and questions were answered accurately. The OCR works well - Spotlight finds my documents. But today I discovered the 'fake duplex' feature and it's a wonderful feature for those of us with single sided (non-duplex) scanners. I used a duplex scanner for several years so never had occasion to discover this feature, but my new scanner has only a single-sided sheet feeder. More than once I found myself reordering scanned pages after a front, then back scan of a multipage document. Fake duplex relieves me of that. It's awesome.